On December 5, 2017, friars of the communities of the Provincial Residence, West Orange, New Jersey, and Tagaste Monastery, Suffern, New York, joined the community of St. Nicholas of Tolentine Monastery, Union City, New Jersey, celebrate the 429th Foundation Day of our Order. Fr. José Ernil Almayo, OAR, Provincial Secretary of the Province of St. Ezekiel Moreno, also joined in the celebration. The day started with a bilingual Mass at St. Augustine Parish, Union City, presided by Fr. José Antonio Ciordia, OAR, with ten Augustinian Recollect Priests as con-celebrants. After the homily, the 11 friars renewed their vows of poverty, chastity, and obedience, in the presence of about a hundred parishioners. After the Mass, the celebration continued with a delightful dinner and fraternal get-together at the Monastery of St. Nicholas. On October 28, 2017, Fr. Galo Espinoza, OAR, celebrated his silver jubilee- 25 years of priesthood! Fr. Galo presided at the Eucharist at Mary, Star of the Sea Church in Oxnard, California. Fr. Galo is presently Pastor/Prior of Mary, Star of the Sea. Many fellow Recollects were in attendance along with several of Fr. Galo’s family members and many dear friends and parishioners. Fr. Provincial, Michael Rafferty, OAR, was the homilist. Following the Mass, many of the parish’s dedicated volunteers prepared a festive banquet in the Parish Hall. In addition to the delicious food, there was also a variety of entertainment including children’s choirs and dancing and mariachi! It was a wonderful evening of thanksgiving to God and an opportunity to thank God for the devoted ministry of Fr. Galo! Congratulations, Fr. Galo! May the Lord grant you many more years of service to God and His faithful! It is my duty to officially notify you that FATHER JAMES DANIEL MCGUIRE, OAR, died at Rio Hondo Convalescent Hospital in Montebello, California. on September 8, 2017, as a result of a heart attack. He was 88 years old. Father James was born in Kansas City, Missouri, on January 20, 1929. On August 31, 1946, he entered the Novitiate at Saint Augustine Monastery in Kansas City, Kansas, and on September 1, 1947, made his simple profession there. He completed his philosophical studies at the same monastery in Kansas City, where he also made his solemn profession on September 1, 1950. He completed his theological studies at Tagaste Monastery, Suffern, New York, and on September 13, 1953, he was ordained a deacon there. On May 29, 1954, he was ordained a priest at Sacred Heart Parish, Suffern, New York, by Most Reverend James H. Griffiths. After his ordination to the priesthood, he was sent for post-graduate studies at the Catholic University of America in Washington D.C., where he obtained his doctorate in Canon Law (1954-1957). From 1957-1959, he was made prefect of discipline at Tagaste Monastery, Suffern, New York. In 1960, he was appointed provincial secretary until 1966. From 1966- 1968, he was named principal of Stamford Catholic High School in Connecticut. Then, he was appointed provincial procurator (1969-1972), while at the same time, serving as prior of Stamford Catholic High School in Connecticut (1966-1972). In July of 1972, he was elected Prior Provincial of the Province of Saint Augustine, a position he held until November of 1974, when he was elected Prior General of the Order of Augustinian Recollects (1974-1980). After serving as Prior General in Rome, Italy, he was made prior/pastor of Holy Ghost Parish in Omaha, Nebraska (1981-1986); prior of Saint Augustine Monastery, Kansas City, Kansas (1986-1987); prior/pastor of Our Lady of the Pillar Parish, Santa Ana, California (1987-1994); prior/pastor of Saint Augustine Church, Lamont, California (1994-1995); prior/pastor of Saint Mary Church, Fullerton, California (1995-1996); associate pastor of Cristo Rey Church, Los Angeles, California (1996); associate pastor of San Miguel Church, Los Angeles, California (1996-1998), and associate pastor of Saint Benedict Church, Montebello, California, from 1998 until his death. Anyone who knew Fr. McGuire, even as an acquaintance, would concur that he was a man who never minced words. He was a “let your yes mean yes and your no mean no” person through and through. At the same time, Fr. James stood out for his goodness and kindness. He was always carefully faithful, not only in the observance of his duties as a religious but also in his pastoral responsibilities, most especially in the confessional and among the sick. For each of his nearly nineteen years spent at Saint Benedict Parish, Fr. James visited the sick at Beverly Hospital in Montebello at least twice a week. Fr. James constantly expressed helpfulness for the good of the Province and of the Order, dedicating many hours in the task of reviewing books, Newsletters, articles, photos, and bulletins. If there were an error cited in anything he read, Fr. James would spot it in a second! We give thanks to God for the gift He gave us in the life of Fr. James. Please read this letter in community, record it in the official book of death notices, and comply with the prescriptions of No. 94 of our Additional Code. May our union with our deceased brothers testify to the bonds of community. Funeral of Fr. James McGuiire, OAR, September 15, 2017. Frs. Fidel Hernandez and Marlon Beof celebrated their 25th anniversary of religious profession with a morning Mass in the Tagaste chapel on Saturday, September 9. Fr. Michael Rafferty, prior provincial was main celebrant and homilist with Frs. John Gruben, prior, John Oldfield, Fredric Abiera and several visiting priests as concelebrants. The Tagaste (Spanish) choir led the music including the chanting of the Litany of the Saints. Afterward SAR and Guild members enjoyed a very satisfying lunch provided by the Hispanic community. Jubilee Mass: Frs. Michael Rafferty (c) with Frs. 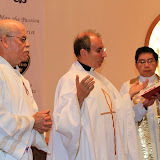 Marlon Beof (l) and Fidel Hernandez and concelebrating priests and servers. Frs. Fidel (l) and Marlon renew their religious vows at Jubilee Mass. Formation Retreat in Cuernavaca, Mexico. As part of the process of the union of the provinces of St. Augustine and St. Nicholas of Tolentine, the Commission for the Union of both Provinces sent Fr. Fredric Abiera, OAR, to Casa de la Recoleccion in Cuernavaca, Mexico, to join the 9 postulants of Postulantado San Agustin (El Hueso, Mexico, D.F.) for their annual retreat on September 14-17, 2017. Fr. Javier Monroy, currently a General Councilor and prior of the community of Collegio Sant' Ildefonso in Rome, Italy, was the retreat master who led the talks, prayers, and sharing. The purpose of Fr. Abiera's trip, as recommended by the commission, was to get familiarized with the formation program of the Vicariate of Mexico-Costa Rica, and also as part of the interprovincial experience, even just for a few days, thus, showing a good symbol of cooperation between the two provinces as the date for the union of both provinces is getting closer (in May of 2018). Fr. Javier Acero, OAR, the vicar of the Vicariate of Mexico-Costa Rica, Fr. Oscar Castellanos, OAR, the formator of the postulants, and Fray Jorge Quiroz, OAR, recent graduate of the formation house in Las Rozas, Madrid, Spain, were also present at the retreat. The topic of the retreat was "The Augustinian experience of God." Fr. Monroy challenged all those present to examine the "desire of his heart" and "his search for the truth." Indeed, this 3-day retreat offered all those present a wonderful experience of community living and Augustinian Sprituality.